A huge change in 2011, Ducati have withdrawn their factory team, BMW have increased their commitment and Ten Kate have gained the fabulous Castrol Racing livery/support for their Honda CBR 1000RR machinery. Major rider changes include Leon Haslam moving from Suzuki to join Troy Corser in the works BMW team, James Toseland and WSBK 2010 Superstock winner Ayrton Badovini head up a new team called BMW Motorrad Italia. Johnny Rae welcomes? Ruben Xaus into the aforementioned Castrol-Ten Kate Honda team. BMW increasing their commitment to WSBK, that was more than enough enticement to ensure my return to 'PI' for the first WSBK event of 2010. Troy Corser, Ruben Xaus, Andrew Pitt and Roland Resch piloted the BMW S1000RR's with promising results. After four years in MotoGP, Chris Vermeulen moved across to Superbikes and rode a Factory Kawasaki ZX10R with new team mate Tom Sykes. The clickable image, a 0.004 of a second winning margin in Race 1!! Being a huge fan of BMW Motorcycles I had followed with anticipation the efforts of the BMW Factory, Troy Corser, (clickable image) and Ruben Xaus, to make the new BMW 'four cylinder in line' S1000RR competitive from day one. Whilst not placing, both Riders performed very well. The team, machinery, presentation, Riders availability on practice day, just superb, a close second to the long established Ducati Factory Team. Interest was also centred on Nori Haga, moving from the Corser/Haga Yamaha Team of 2008 onto the ex Troy Bayliss works Ducati seat, to the amazement of all 'the find of 2009' quickly emerged for Yamaha, Ben Spies! A must visit, Troy Bayliss' final year of WSBK competition and he went on to again take the WORLD SUPERBIKE CHAMPIONSHIP in style, a fantastic way to cap a brilliant career!! 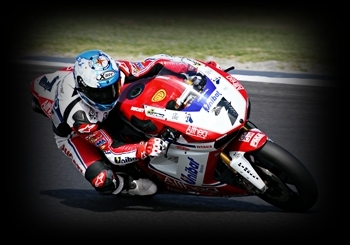 The 'clickable' image is of Troy Bayliss coming onto the Phillip Island Main Straight. Troy Corser and Andrew Pitt were also right at the top of their game, a great weekend for Australian Riders against the worlds best.